Description: Gardenias are a nice addition to any landscape. Not only do they have nice green foliage, but their white (or yellow) flowers also bring fragrance to the garden. 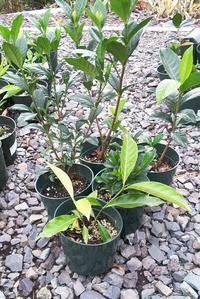 We grow many different varieties, including Amy, Camellia, Little Gem, Radicans, Mini Tahitian, Kiele Kula, and Veitchii.